Lahore (Tuesday, July 03, 2018):- The Central directorate of National savings of Pakistan سنٹرل ڈائریکٹوریٹ آف نیشنل سیونگس آف پاکستان (CDNSP) will held a balloting of Rs.15000 Prize bond Draw #75 dated 3rd July, 2018 list Result at Lahore city today. The Fifteen thousand Prize bond Draw Number seventy five complete online by savings.gov.pk on 03rd of July (03.07.2018) download online. 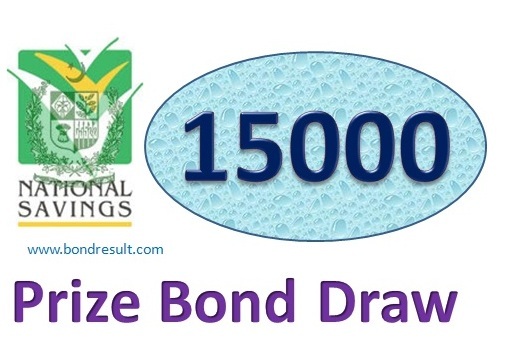 This draw of Prize bond Rs 15000 is counted 75th draw till so far. The draw detail for the first second and third prize winning lucky numbers be finding out at 5:00 pm on this page. The list will is align accordingly and easy to find. The 1st and 2nd winning lucky digits will be shared at 9:10 am by bondresult on this page. 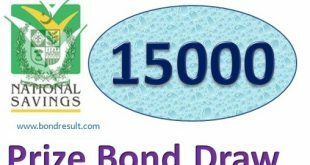 You may be one that have bought some worthy prize bond and now waiting for this 15000 prize bond draw on 03 July 2018 by National Savings of Pakistan. The time have come and the draw will be balloted today. This is years third and totally this is 75th Draw of Fifteen Thousand prize bond. The draw date have been decided in the prize bond schedule 2018 and now time is here when you will be able to see the whole draw list in your hand & eyes. The 15000 Prize bond draw result July 2018 Lahore have been choose to held on 3rd of July instead of 02 July due to Public holiday in Banks come under State Bank of Pakistan. The Fifteen Thousand prize bond will held on 03.7.2018 Tuesday and you will be able to view the full draw list here. But what is the amount of prizes and number of Prize that will be given to winners of this latest draw held at Lahore city. The first Prize amounting 3 Cror will be given to one and one only Lucky number. This is biggest amount of the 15000 Prize bond draw year 2018. The first prize lucky number will be announced at the beginning of the draw. The 2nd prizes as will be announced along with first prize. The 2nd Prize winning amount is 02 Cror. This prize will be given to 03 lucky winners. And the final prize nominated as third prize having amount 185 Thousand will be given to 1696 lucky winners. The 75th draw of 15000 Prize bond 2018 that is being held in Lahore city will be held on 03th July 2018 (Tuesday منگل) and the first wheel be spin on 9:00 and the first and 2nd prize winning number will be announced on social media and live TV broad cast like Kohenoor TV and JoJo tv. The full draw list including the third prize winning numbers will updated at 5:00 pm by savings.gov.pk. 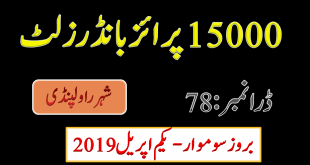 You can download Prize Bond List 15000 Draw No, 75 Held at Lahore (03 July 2018 on bondresult.com’s this page. So Keep visiting us for latest prize bond draw list, result, schedule and news.